Images honoring Confederate generals Robert E. Lee and Leonidas Polk have been removed from a Cincinnati cathedral. Symbols of the Confederacy that have long been a part of one of Cincinnati's oldest churches are slated for removal. The journey to this decision started one year ago for Christ Church Cathedral following a sermon by Dean Gail Greenwell. From her pulpit, she challenged the cathedral’s vestry to consider what to do with the memorials – a plaque honoring Episcopal bishop and Confederate Gen. Leonidas Polk and a stained glass pane honoring Confederate Gen. Robert E. Lee – and to review what might be missing from the church. The vestry accepted the challenge. Two scholars were brought in to discuss the context of the symbols and the issue of Confederate memorials in general. Conversations and listening session were held, according to the cathedral's head of the vestry, Senior Warden Don Lane. Various opinions and concerns were considered by the vestry before a decision was made. It’s too bad that can’t be repeated on the national stage, he added. Greenwell long held the belief that the future of the Confederate symbols within the cathedral needed review. Her concern gained urgency following the Aug. 12, 2017, "Unite the Right" gathering of white nationalists and other right-wing groups in Charlottesville, Virginia. They were there, reportedly, to defend a statue of Gen. Robert E. Lee that faced removal by city council orders. Counterprotesters came out in force and clashed with the white nationalists. The encounters resulted in bloodshed and loss of life. Heather Heyer, a 32-year-old counterprotester from Charlottesville, was killed after being hit by a car allegedly driven by Boone County native and Ohio resident James Alex Fields Jr. 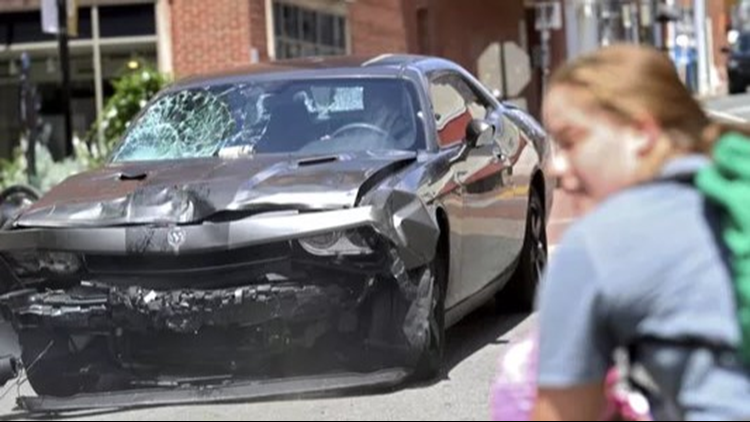 Prosecutors say he plowed through a group of counterprotesters with a Dodge Challenger he purchased from a Northern Kentucky car dealership. In June, Fields was charged with multiple federal hate crimes. He pleaded not guilty. He also faces first-degree murder charges in Virginia. Trooper Berke Bates and Lt. H. Jay Cullen, Virginia State Highway Patrol, were killed in a helicopter crash while assisting public safety resources during the protests. Multiple factions could face off again as "Unite the Right 2" takes place Aug. 12 in Washington, D.C. Ahead of the weekend, the one-year anniversary of the first "Unite the Right" event, Charlottesville is in a state of emergency. Statues of Robert E. Lee and Thomas “Stonewall” Jackson remain standing in Charlottesville. Their future remains uncertain. The future of other Confederate symbols is more clear. Since 2015, at least 110 state and local government symbols and monuments have been removed, according to a report from the Southern Poverty Law Center. They now number over 1,700, up from the 1,500 cataloged in 2016 by SPLC. The increase, according to the center, reflects new information gathered on the symbols and monuments. The data does not reflect thousands of markers, monuments or other tributes on or within battlefields, museums, cemeteries and other historical places. At Christ Cathedral Church, the Lee image is captured in a richly colored pane of stained-glass alongside an image of Bishop William Meade. The two images are part of the same installation. For cohesiveness, the vestry decided that both will be replaced with images of abolitionist Frederick Douglass and abolitionist and Underground Railroad conductor Harriet Tubman. These were the recommendations from the cathedral's Christian Heroes Committee, Lane said. 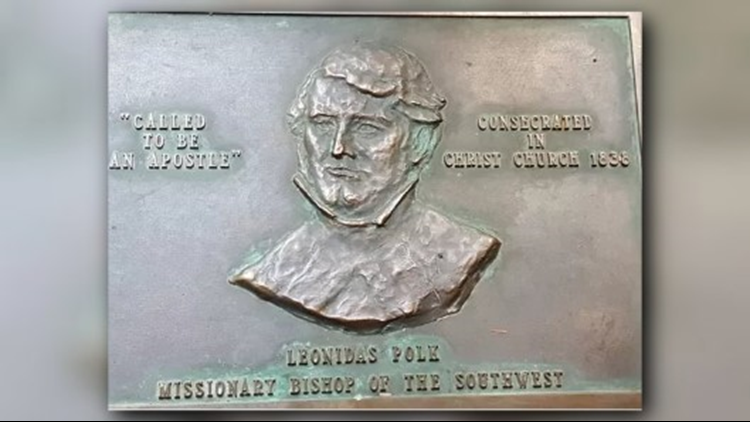 The plaque in the church narthex depicting Polk as well as an adjacent plaque dedicated to Charles Henry Brent, a noted Episcopal missionary and bishop, were removed. The Confederate images will remain at the church in storage, church officials said. An issue wrestled with during the discernment process was that the cathedral's forefathers, during the Civil War, remained silent on slavery, Lane said. "And some of the work that we've done, not only on these memorials but also on the Heroes Committee, is really a means to reconcile that the folks of our church were silent," he said.